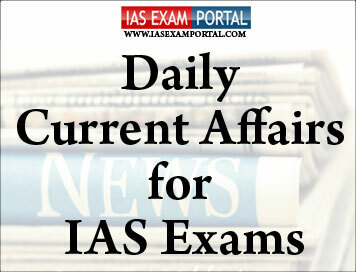 Current Affairs for IAS Exams - 23 JANUARY 2019 | IAS EXAM PORTAL - India's Largest Community for UPSC Exam Aspirants. At the annual PravasiBharatiya Divas in Varanasi on Tuesday, Prime Minister NarendraModi highlighted India’s potential to lead the world in sustainable development. Mr.Modi also said the people living abroad need to connect culturally with the homeland, and announced that India is planning a pilgrimage scheme for people living abroad. Mr.Modi said that Indians living abroad should work to inspire foreigners to visit the country. “I have said before and I reiterate now. Wherever you live and if you have five non-Indian families near you then motivate them to visit India. Your attempts will help in boosting the tourism sector of India”. Apart from noted persons of Indian origin, the event is also being attended by a large number of foreign dignitaries including Mauritius Prime Minister PravindJugnauth who will also participate in the KumbhMela in Prayagraj. Mr.Modi also urged foreign-based Indians to contribute to the making of the ‘new India’ and said people of Indian origin living abroad are not far from their place of origin. He highlighted government schemes like Make in India and other welfare schemes including the ones that involved direct transfer of cash benefit. Mr.Modi said his government is trying to improve ties between the Indians based abroad and highlighted the easy e-visa scheme that helps in smoother paper work for travel purposes. The Commission wrote to the Deputy Commissioner of Police (New Delhi), alleging that by making such claims, Mr.Shuja had caused public mischief, which is an offence under Section 505(1) (b) of the Indian Penal Code (IPC). Following doubts raised by various political parties, the Commission, on June 3, 2017, organised an “open challenge”, inviting experts to demonstrate any vulnerability in the machines, the poll panel said. “Nobody turned up for such demonstrations,” said the EC in its complaint, adding that the act of Mr.Shuja was violative of Section 505(1)(b). The police said they had received the complaint and that legal action was being taken under Section 505 of the IPC. They would further explore if more penal provisions were needed to be invoked. The Commission on Tuesday said that members of the Technical Experts Committee (TEC) have reconfirmed to the poll body that EVMs were tamper-proof. The Non-filers Monitoring System (NMS) aims to identify and monitor persons who enter into high value transactions and have potential tax liabilities but have still not filed their tax returns. Analysis was carried-out to identify non-filers about whom specific information was available in the database of the Income Tax Department. The Department has enabled e-verification of these NMS cases to reduce the compliance cost for taxpayers by soliciting their response online. It is reiterated that there is no need to visit any Income Tax office for submitting response, as the entire process is to be completed online. The PAN holder should submit the response electronically on the Compliance Portal and keep a printout of the submitted response for record purposes. User Guide and FAQs are provided under the “Resources” Menu on Compliance Portal. China is on course to overhaul its military by pumping in technology and cutting down personnel, to enable its leaner armed forces to project power far beyond their borders. The Xinhua news agency reported that for the first time, the Army now absorbs less than half of the total personnel in the Chinese armed forces. Beijing is also modernising its nuclear deterrent, based on a triad of long range missiles, bombers that can deliver atomic weapons, and nuclear submarines. The size of China’s Type 094 nuclear submarines, which entered service in 2010, is expected to climb to eight by 2020. The Xinhua report signalled that the Navy, Air Force, rocket force and strategic support force, which handle areas such as cyber warfare, comprise more than half of China’s armed forces. Besides, the entire chain of command in the People’s Liberation Army has been changed to enable integrated warfare of all combat units, steered by a joint operational chief of staff. China’s intent to cut down it human resources had become visible, even earlier when President Xi announced in September 2015 that he intended to shed 300,000 troops from the PLA. Despite its long-term goal of military advancement, some analysts say China will have to consistently add new aircraft carriers to dominate the high seas far away from its shores. The Trump administration can go ahead with its plan to restrict military service by transgender men and women while court challenges continue, the Supreme Court said on Tuesday. The court split 5-4 in allowing the plan to take effect, with its five conservatives greenlighting it and four liberal members saying they would not have. As a result of the court’s decision, the Pentagon can implement a policy so that people who have changed their gender will no longer be allowed to enlist in the military. The policy also says transgender people who are in the military must serve as a member of their biological gender unless they began a gender transition under the less restrictive Obama-era rules. Exercise SEA VIGIL aims to comprehensively and holistically validate the efficacy of the measures taken since '26/11'. Seaward monitoring during the exercise will entail patrolling off coast, in Offshore Development Areas and off our islands by the Indian Navy, Indian Coast Guard, supported by the State Marine Police. All Operational assets of the Indian Navy and Indian Coast Guard are participating in the SEA VIGIL. The conduct of the exercise SEA VIGIL is also being facilitated by the Ministries of Defence, Home Affairs, Shipping, Petroleum and Natural Gas, Fisheries, Customs, State Governments and other agencies of Centre/ State. Team India skipper ViratKohli today ed history by becoming the first player in history to win the Sir Garfield Sobers Trophy for ICC Cricketer of the Year. The ICC said in a statement that Kohli also won awards as the ICC Men's Test Player of the Year and the ICC ODI Player of the Year. Kohli was also named captain of ICC's Test and ODI teams of 2018 for a fabulous run in international cricket. India's victory in the Under-19 World Cup was voted as the Fans' Moment of the Year.The 36-member voting panel was unanimous in picking Kohli for the Sobers award. He also ended the year at No. 1 in both the rankings for Tests and ODIs.